Phil Chadwick's Art: #0065 "Abandoned in the Snow"
#0065 "Abandoned in the Snow"
An old style lobster pot in the snow at Eastern Passage just east of Dartmouth, Nova Scotia in the winter of 1977-1978. I had carefully lifted this lobster pot from the stack beside the fishing hut. I did not wish to paint a thousand lobster traps. After taking a few pictures I placed it back on top. I noticed a man in a pick-up truck watching me very closely probably to make sure that I meant no harm. 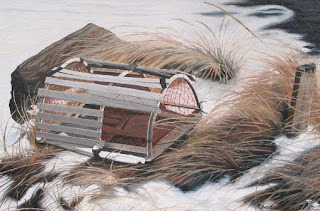 The lobster pot really was not abandoned in the snow for more than a few minutes.